Left to right, Caroline Herzog, Erin Herzog and Rebecca Johnson travel together in order to attend Seton Catholic Central School. Peter Meyer, former editor of Life magazine, commented on the statement that Catholic schools have to become expert fundraisers. Meyer noted that more than that was required. He added marketers, promoters and lobbyists to the necessary roles of today’s Catholic schools. 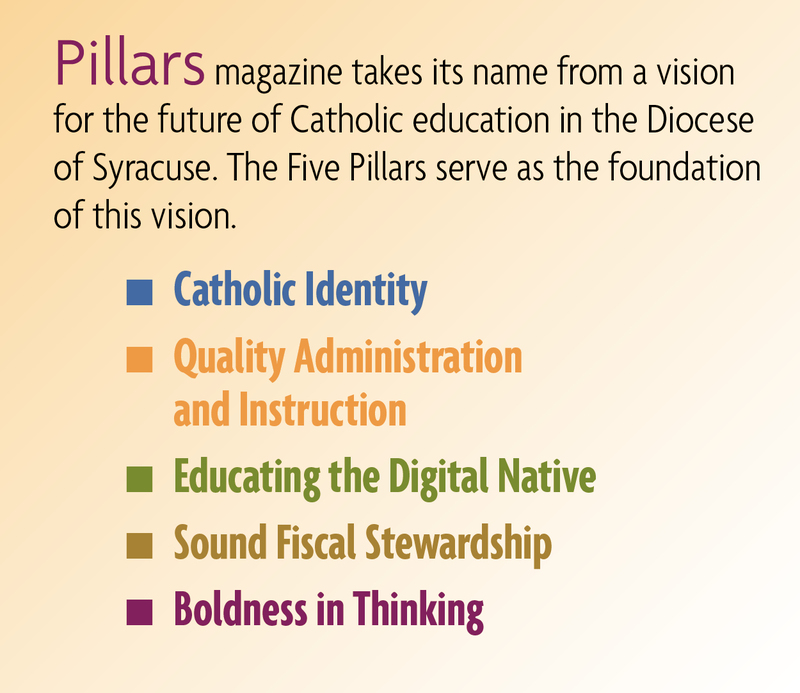 All of our Catholic schools excel in providing a strong Catholic education. But several in Central New York have mastered the tasks mentioned above and are enjoying an increase in enrollment as a result. They attribute this to keeping a keen eye on the environment around them while making an important investment — in themselves. According to Jim Jones, enrollment director for Notre Dame Junior/Senior High School and Elementary School, Utica’s Catholic schools have experienced growth at both the elementary and high school levels. “We’re up 23 kids at the high school, and we have two more students shadowing current students in the next two weeks. It hasn’t slowed at all since summer,” he said, adding that both the elementary and the high school are “bottom heavy” and younger classes are seeing the biggest jump in numbers. “But even the best efforts and grassroots can only take you so far,” he noted. Jones said that approximately 10 months ago, Notre Dame’s marketing committee mobilized and together with the administration made a three-pronged commitment to strengthening the schools. Thanks to strong leadership, the group was able to move efforts to the next level. In the past, prospective families were provided tours by the assistant principal, the guidance counselor, campus minister or anyone else available on a given day. Now there is a system in place that provides one point of contact and more of a flow with contact sheets and follow-up processes. The committee members began familiarizing themselves with what universities and other private educational institutions were doing in recruitment. “Colleges and private schools consider it a science and know you have to make a significant commitment to reap the results,” Jones said. Bishop Ludden High School in Syracuse, NY, has found results with similar strategies, according to Development Director Gallagher Driscoll. The development committee members “challenged each other and then challenged us to make a financial commitment to growth,” he said. Driscoll spent 16 years in collegiate basketball and said the recruitment strategies directly translate to Catholic schools. “When you meet parents, you want to earn their trust. They want to make sure their child is in good hands and that you’re looking out for them,” he explained. Part of the approach includes alumni from Bishop Ludden who are invited to help engage new families. Successful graduates from all walks of life write letters to potential students describing their positive high school experience. “When it’s coming from someone else, it means something more,” Driscoll said. 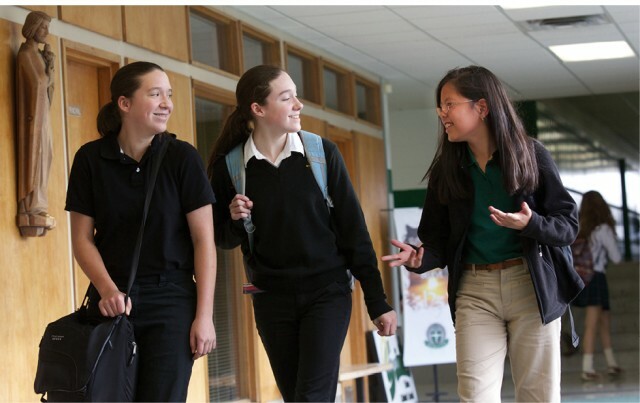 For Seton Catholic Central School in Binghamton, NY, a strategy for nudging enrollment involves literally broadening its horizons. “We’re looking at branching out in a number of directions,” said Principal Richard Bucci, who noted that the school has set its sights on finding a way to provide continuing high school education to Catholic school students in Chenango and Tioga counties. “Both of these communities have families that, because of distance, have been kind of boxed out of continuing with Catholic education,” he said. Seton started by looking at ways to bring Holy Family students from Norwich, NY, to its building. Bradley invited Bucci to meet with several families who expressed an interest in continuing Catholic education in the area. “It looked like an insurmountable wall, and we really had to explore a feasible way to get them here. So, we said where there’s a will, there’s a way,” Bucci said. With logistical details worked out, today four students climb into a car together every morning at Holy Family for the drive to Seton Catholic, and they return together at the end of the day. “We’re breaking new ground for potential growth and expanding the range of Catholic education in the Southern Tier,” Bucci said. Besides the partnership program with Seton, Bradley added that Holy Family has seen some leaps in its early childhood education programs. The school was quick to respond to a loss of other early childhood services in their area. “Being in a small area, we didn’t have to go out and research. It was right in our newspaper,” he said. The increase in students meant adding an additional class for 4 year olds and some reworking of room use and schedules. At Trinity Catholic School in Oswego, NY, Principal Barbara Sugar said that the growth her school is experiencing is due to a combination of elements. Like Notre Dame, the growth has been bottom heavy with increases most obviously in the pre-school through 4th grades. She attributes part of the growth to the changing environment of public schools. “Parents see what is going on in their communities and are beginning to look for the structure and religious basis for their children,” she said, noting that the majority of the new students at Trinity are public school transfers.